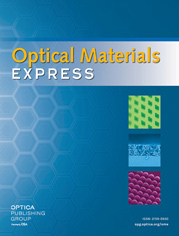 We introduce shape-memory polymers (SMP) as substrate material for active optical devices. As an exemplary application we build a tunable organic semiconductor distributed feedback (DFB) laser. Hence, we transfer a second order Bragg grating with a period of 400 nm into SMP foils by hot embossing. The composite organic gain medium Alq3:DCM evaporated on the SMP substrate serves as laser active material. Mechanical stretching of the substrate increases the grating period temporarily and triggering the shape-memory effect afterwards reduces the period on demand. In this way, we can adjust the grating period to achieve a broad continuously tuning of the laser emission wavelength by 30 nm. A. Lendlein and R. Langer, “Biodegradable, elastic shape-memory polymers for potential biomedical applications,” Science 296, 1673–1676 (2002). A. Lendlein and S. Kelch, “Shape memory polymers,” Angew. Chemie 41, 2034–2057 (2002). D. Ratna and J. Karger-Kocsis, “Recent advances in shape memory polymers and composites: a review,” J. Mater. Sci. 43, 254–269 (2008). Q. Meng and J. Hu, “A review of shape memory polymer composites and blends,” Composites 40, 1661–1672 (2009). A. Lendlein, Shape-Memory Polymers (Springer, Berlin, 2010). T. Xie, “Recent advances in polymer shape memory,” Polymer 52, 4985–5000 (2011). J. Leng, X. Lan, Y. Liu, and S. Du, “Shape-memory polymers and their composites: Stimulus methods and applications,” Prog. Mater. Sci. 56, 1077–1135 (2011). C. M. Yakacki, R. Shandas, C. Lanning, B. Rech, A. Eckstein, and K. Gall, “Unconstrained recovery characterization of shape-memory polymer networks for cardiovascular applications,” Biomaterials 28, 2255–2263 (2007). H. Xu, C. Yu, S. Wang, V. Malyarchuk, T. Xie, and J. A. Rogers, “Deformable, programmable, and shape-memorizing micro-optics,” Adv. Funct. Mater. 23, 3299–3306 (2013). A. Espinha, M. C. Serrano, and A. Blanco, “Thermoresponsive shape-memory photonic nanostructures,” Adv. Optical Mat. 2, 516–521 (2014). N. Schneider, C. Zeiger, A. Kolew, M. Schneider, J. Leuthold, H. Hölscher, and M. Worgull, “Nanothermoforming of hierarchical optical components utilizing shape memory polymers as active molds,” Opt. Mater. Express 4, 1895 (2014). D. Schneider, T. Rabe, T. Riedl, T. Dobbertin, M. Kröger, E. Becker, H.-H. Johannes, W. Kowalsky, T. Weimann, J. Wang, P. Hinze, A. Gerhard, P. Stössel, and H. Vestweber, “An ultraviolet organic thin-film solid-state laser for biomarker applications,” Adv. Mater. 17, 3134 (2005). Y. Oki, S. Miyamoto, M. Maeda, and N. Vasa, “Multiwavelength distributed-feedback dye laser array and its application to spectroscopy,” Opt. Lett. 27, 1220–1222 (2002). T. Woggon, S. Klinkhammer, and U. Lemmer, “Compact spectroscopy system based on tunable organic semiconductor lasers,” Appl. Phys. B 99, 47–51 (2010). S. Klinkhammer, T. Woggon, C. Vannahme, U. Geyer, T. Mappes, and U. Lemmer, “Optical spectroscopy with organic semiconductor lasers,” Appl. Phys. B 99, 47–51 (2010). X. Liu, P. Stefanou, B. Wang, T. Woggon, T. Mappes, and U. Lemmer, “Organic semiconductor distributed feedback (dfb) laser as excitation source in raman spectroscopy,” Opt. Express 21, 28941–28947 (2013). X. Liu, S. Lebedkin, T. Mappes, S. Köber, C. Koos, M. Kappes, and U. Lemmer, “Organic semiconductor distributed feedback laser as excitation source in raman spectroscopy using free-beam and fibre coupling,” Opt. Express 21, 28941–28947 (2013). T. Voss, D. Scheel, and W. Schade, “A microchip-laser-pumped dfb-polymer-dye laser,” Appl. Physics B 73, 105–109 (2001). K. Suzuki, K. Takahashi, Y. Seida, K. Kumagai, and Y. Taniguchi, “A continuously tunable organic-solid state laser based on a flexible distributed-feedback resonator,” Jpn. J. Appl. Phys. 42, L249–L251 (2003). M. R. Weinberger, G. Langer, A. Pogantsch, A. Haase, E. Zojer, and W. Kern, “Continuously color tunable rubber laser,” Adv. Mater. 16, 130–133 (2004). B. Wenger, N. Tétreault, M. E. Welland, and R. H. Friend, “Mechanically tunable conjugated polymer distributed feedback lasers,” Appl. Phys. Lett. 19, 193303 (2010). P. Görrn, M. Lehnhardt, T. R. W. Kowalsky, and S. Wagner, “Elastically tunable self-organized organic lasers,” Adv. Mater. 23, 869–872 (2011). S. Döring, M. Kollosche, T. Rabe, J. Stumpe, and G. Kofod, “Electrically tunable polymer DFB laser,” Adv. Mater. 23, 4265–4269 (2011). J. Wang, T. Weimann, P. Hinze, G. Ade, D. Schneider, T. Rabe, T. Riedel, and W. Kowalsky, “A continuously tunable organic dfb laser,” Microelectron. Eng. 78–79, 364–368 (2005). Z. Li, Z. Zhang, A. Scherer, and D. Psaltis, “Mechanically tunable optofluidic distributed feedback dye laser,” Opt. Express 14, 10494–10499 (2006). F. B. Arango, M. B. Christiansen, M. Gersborg-Hansen, and A. Kristensen, “Optofluidic tuning of photonic crystal band edge lasers,” Appl. Phys. Lett. 91, 223503 (2007). S. Klinkhammer, T. Woggon, U. Greyer, C. Vannahme, T. Mappes, S. Dehm, and U. Lemmer, “A continuously tunable low-threshold organic semiconductor distributed feedback laser fabricated by rotating shadow mask evaporation,” Appl. Phys. B 97, 787–791 (2009). S. Klinkhammer, X. Liu, K. Huska, Y. Shen, S. Vanderheiden, S. Valouch, C. Vannahme, S. Bräse, T. Mappes, and U. Lemmer, “Continuously tunable solution-processed organic semiconductor dfb lasers pumped by laser diode,” Opt. Express 20, 6357–6364 (2012). R. Ozaki, T. Shinpo, K. Yoshino, M. Ozaki, and H. Moritake, “Tunable liquid crystal laser using distributed feedback cavity fabricated by nanoimprint lithography,” Appl. Phys. Express 1, 012003 (2008). S. Klinkhammer, N. Heussner, K. Huska, T. Bocksrocker, F. Geiselhöringer, C. Vannahme, T. Mappes, and U. Lemmer, “Voltage controlled tuning of an organic semiconductor distributed feedback laser using liquid crystals,” Appl. Phys. Lett. 99, 023307 (2011). I. D. W. Samuel and G. A. Turnbull, “Organic semiconductor lasers,” Chemical Reviews 1074, 1272–1295 (2007). M. Worgull, Hot Embossing - Theory and Technology of Microreplication (Micro and Nano Technologies, Elsevier Science, William Andrew, Norwich, NY, 2009). V. Saile, U. Wallrabe, O. Tabata, and J. G. Korvink, eds., LIGA and Its Applications (Wiley-VCH, Weinheim, 2009). S. Klinkhammer, “Durchstimmbare organische Halbleiter,” Ph.D. thesis, Karlsruhe Institute of Technology, Karlsruhe, Germany (2011). C. Vannahme, S. Klinkhammer, A. Kolew, P.-J. Jakobs, M. Guttmann, S. Dehm, U. Lemmer, and T. Mappes, “Integration of organic semiconductor lasers and single-mode passive waveguides into a pmma substrate,” Microelectron. Eng. 87, 693–695 (2010). C. Vannahme, S. Klinkhammer, U. Lemmer, and T. Mappes, “Plastic lab-on-a-chip for fluorescence excitation with integrated organic semiconductor lasers,” Opt. Express 19, 8179–8186 (2011). Fig. 1 Schematic of a tunable organic semiconductor distributed feedback laser device consisting of a nanostructured flexible substrate made of shape-memory polymers and an organic laser active layer. The shape-memory polymer substrate features a hot embossed second order Bragg surface grating as resonator and is mechanically pre-stretched. The organic semiconductor material Alq3:DCM serves as laser active medium. While the device is heated by the thermoelectric module, the smaller original grating period recovers and the grating period as well as the emission wavelength of the device are adjustable. Fig. 2 a) The permanent shape of the SMP resonator with the grating period Λ possess netpoints linked with each other by completely relaxed switching segments. b) By mechanically stretching the SMP foils the period increases to Λ* and on the molecular level the switching segments get elongated and fixed in a new shape. c) The fabrication of such a surface grating by hot embossing leads to uniformly replicated grating with a period of 400 nm. d) After stretching the grating, the enlarged period of 440 nm is evenly distributed over the whole substrate as revealed by the AFM topography image. Fig. 3 a) Input-output characteristics used to determine the lasing threshold which was observed at ≈150 μJcm−2. b) The laser spectra measured after 1.5 · 105 and 106 pump pulses under non-stop optical pumping. The pump energy does not trigger the recovery process though degradation of the organic material led to a decreased lasing intensity. Fig. 4 a) The wavelength shift from 630.2 nm to 600.2 nm is shown by several emission spectra recorded during the recovery process of a heated SMP grating substrate with Alq3:DCM. The grating period was pre-stretched by 10 % to 440 nm. b) The false color image of the same data demonstrates the shift and the decreasing intensity of the emission peak with time. Fig. 5 The temperature dependence of the shape recovery process can be used to adjust the emission wavelength to a previously chosen value. After heating the sample the emission wavelength decreased until we switched off the thermoelectric module, by what the temperature decreased and the recovery process stopped. As a result the emission wavelength stayed constant as long as the device was exposed to temperatures lower than Tswitch. After switching on the thermoelectric module, the temperature raised again, the recovery process continued and the emission wavelength decreased with approximately the same velocity as before. The laser spectra (1)–(4) below the main graph were recorded at the corresponding transition points and are normalized relative to the first spectrum (1).